The front disc brakes in a car are responsible for stopping the car in its tracks with the help of brake pads and brake callipers. Without properly functioning brakes an accident is bound to happen. Therefore, proper care has to be taken off the brakes. When you press the brake pedal, the front disc brakes are usually the ones getting the signal. The brake rotors run in tandem with the wheel, therefore, to stop the wheel from moving the brake callipers press the brake pads against the brake rotors to stop the car. The disc brakes found in a car use the concept of friction to slow the car down. Friction can very easily wear out any component and brakes are no exception. As a result of them being worn out you will start to feel and hear a few signs that will signal you towards failing disc brakes. The brake pads found in disc brakes are made of high-quality rubber, so they are supposed to last long but when they do fail, they start to produce noise in the brakes. The squealing noise can be heard if you press the brakes hard. 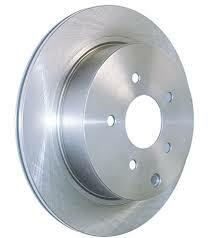 Furthermore, the brake rotor can also be a cause for problems with the brake. If the brake rotor has an uneven surface or if the rotor has scratches, you are bound to hear a loud unpleasant noise from your car’s front brakes. When the brakes are worn out they take longer to bring the car to a halt. This is possible if the calipers fail to press down on the brake pads hard enough. This is also an indication of a failure in the brake’s hydraulic system. However, this symptom can occur mostly because the brake pads have worn out. The worn-out brake pads cannot stop the car as fast as new ones can. Therefore, if you are feeling a sensation like this visit the mechanic as soon as possible. The brake’s rotors do not come in contact with anything other than the brake pads. Hence, the only explanation for scratch marks on the rotor can wear out brake pads. If you are not careful about replacing your car’s brake pads on time, you can seriously damage the brake rotors. And brake rotors are not cheap. The first thing you should do if you suspect that your discs are worn out is to inspect them carefully. By using this method you can check and try to fix and clean them in the best possible way. If you suspect that you have got grease on them it can also be a good idea to clean them if the discs look good overall. First, you should start by raising up your car with a floor jack and jack stands. If you do not have a floor jack you can check our review of the best floor jacks. By removing the tires you can inspect the disc a lot better to see if there is any damage to it.
. Make sure that you check both front brake discs. Since you only took off the wheel, all you have to do is put it back on and voila! Mission accomplished! Disc brakes can be checked in two ways either by driving your car or by lifting the front end of your car with a jack and checking them. While the latter of these methods is a bit impractical, the former is more practical, so we will start off with that first. Checking the front disc brakes while driving is easy. First, try to drive slow and brake after every 3-5 seconds to check the strength of the brakes. Once you are confident with their performance at slow speeds you can speed up and do the real tests. Finally, accelerate to 30-40 mph and brake hard. If everything is good, you will probably feel the tightness of the brakes and a sudden jerk. Make sure there are no vibrations in the steering wheel when braking and that the car is not going to the right or left when braking. If you have vibrations in your steering wheel when braking, it’s probably the front brake discs that are imbalanced and have to be replaced. You can learn more about these symptoms here: Why is my Steering Wheel Shaking? There is not one but three major components that can fail in a braking system. The brake pads are probably the most prone to failure due to their nature of being made of rubber. Rubber can wear out faster than most other materials when it locks horns with friction. Fortunately, brake pads are easy to find and replace. The caliper and rotor, on the other hand, are sturdier. You do often replace the brake pads at the same time as you are replacing the front disc brakes. Also, check that the calipers are working properly before installing it again. All in all, a basic brake system replacement will cost you around $200-$300 excluding labor costs which will amount to $100 – $150. in January 2019 we had all brakes replaced, rotors grounded, fluid flush, the car was not running smooth it was if something was like something was holding it back. Now the brakes are grinding. Mechanics say the calipers failed. Is this common? Are the calipers replaced during the initial brake job?